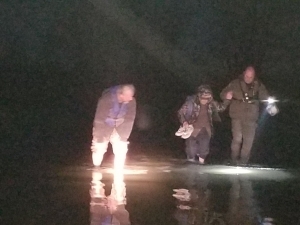 IRRIGON, Oregon — On March 19, 2019, at approximately 10:30pm, UCSO received a request for assistance from two men in a stranded boat on the Columbia River, west of Irrigon, OR. The two Idaho men, ages 81 and 73, stranded their boat after running into a large, shallow sand bar. The men were staying in Umatilla while on a fishing vacation on the Columbia River, and were fishing different sections of the river when became stranded. Sergeant Rowen Hayes and Deputy Rick Carter responded and launched one of UCSO’s jet boats from the Irrigon Marina. With assistance from a deputy with the Morrow County Sheriff’s Office, they located the stranded boat. They rescued the two fishermen and drove them back to shore. The Umatilla County Sheriff’s Marine Patrol Unit, patrols the waters and shore lines on the Columbia River from the Umatilla/Morrow county line to the Washington state border, as well as the McKay Reservoir, Cold Springs Reservoir, and the Umatilla River. The team consists of dedicated deputies with many years of combined experience. We strive to keep the waterways within Umatilla County safe for all who enjoy activities on and around the waters. We also provide boater safety education programs in local schools to teach children about the importance of wearing life jackets, and teach citizens and boat owners about safe boating operations, boating laws and the importance of having the proper safety equipment on board. UCSO works in close partnership with the Oregon State Marine Board, and assists other public safety agencies.